I confess, I’ve been in the throes of infatuation lately. You know the signs … daydreaming constantly about the object of your desires, finding ways to work references to them into conversation, devising schemes to catch even a glimpse of that which makes your heart flutter. Yesterday, I finally succumbed and gave myself over to … could it be? yes … the gas stove of my dreams. Isn’t it handsome? I think we’ll have many happy times together, baking, cooking, heating plates in the warming drawer, using the grill/griddle. Did I mention a convection oven? Swoon. I’ve always wanted a gas stove and finally have the opportunity in the new house. We just started moving things in on Friday and are still based at the old place which I’ve yet to sell (house anyone? great view through the kitchen window! ), but there was no way I was going to let this beauty languish unattended. So, yesterday I schlepped over all the makings for a soup. Although we don’t have a fridge yet I don’t see that as a reason not to cook, especially when winter provides refrigeration right outside the door. 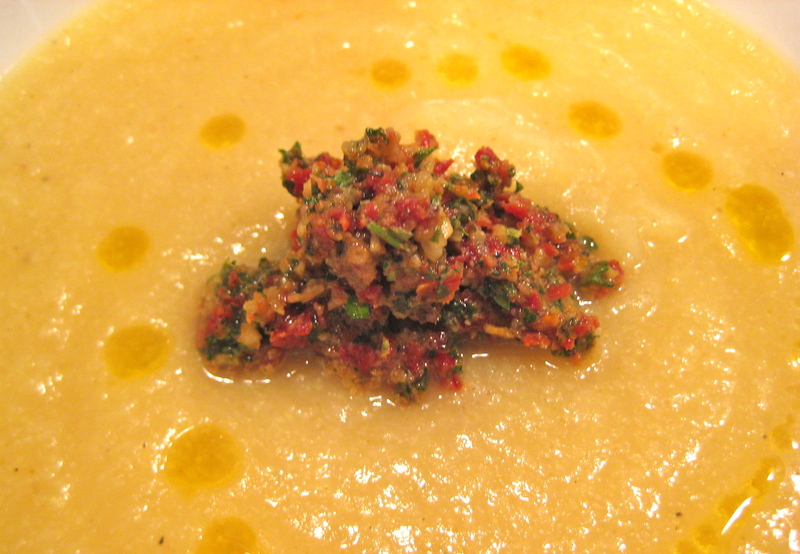 In keeping with the theme of new beginnings in this house and using this stove, I made up something new, a curried cream of cauliflower soup with a sundried tomato and parsley pesto. I know the combination may sound odd, but it worked. I was going to make just the soup base, but when I was shopping I passed some beautiful flat-leaf parsley in the produce aisle that I couldn’t get out of my head, and from that sprang the idea for the pesto. I tried to talk myself out of it, but the inspiration was persistent. Funny how these things develop. Just letting go and listening to which ingredients speak to you can be a great way to cook. I was going to use pine nuts, but they didn’t have any, so I went with walnuts instead. And the sun dried tomato came along for the ride to add both flavour and colour. With fresh crusty rolls, this soup was a fitting culinary tribute to Brent’s and my first home together and the life we are building. I think it did the stove justice, too. The curried cauliflower base was a little too mild for my taste to stand on its own (I measured out the spices at the other house so didn’t have more to add), but with a dollop of the bright and zesty pesto stirred in … well, flavour heaven in a smooth base with richness that belies the healthiness of the dish. As for cooking with gas? I love it! Instant heat, quick responsiveness to adjustments in temperature, and none of the annoying cycling on and off of the ceramic top stove in the old house. It was a revelation to be able to steadily simmer something. I can hardly wait to try out the oven, but I think I’d better go do some more unpacking first. Heat the oil in a Dutch oven, then add the onions and garlic and let them sweat until translucent. Add the curry powder, cumin, salt and a few good grindings of pepper and stir together. Add the potato and cauliflower, then the broth and stir well. Bring to a boil, reduce heat to a simmer and let cook for about 30 minutes. Using an immersion blender, puree until smooth. Taste and adjust for seasonings. In the meantime, prepare the pesto. Well, folks, once again I didn’t measure anything, but here’s my best recollection of how I made this pesto that added colour and zip to the soup. 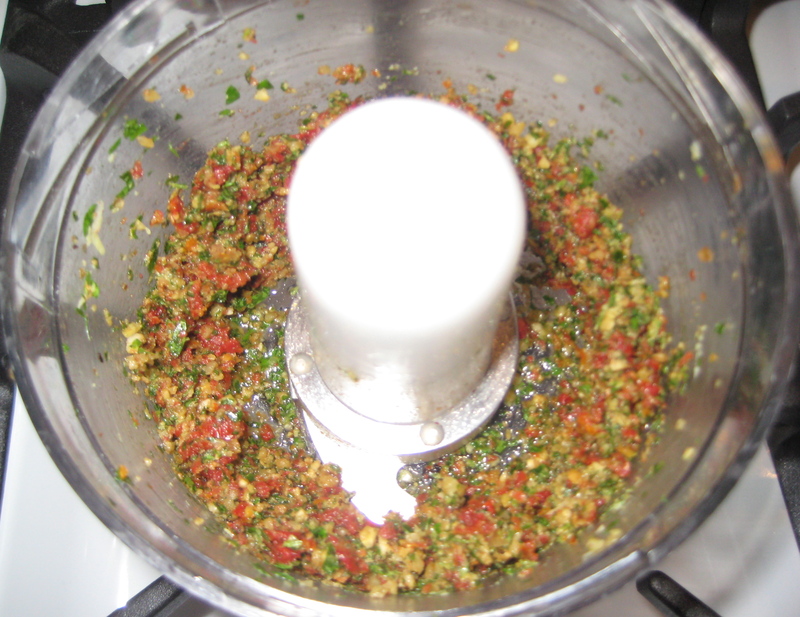 Put all ingredients in a small food processor and puree until well ground. This isn’t a very loose pesto, as I didn’t want to add too much oil into the soup, and I was also drizzling some olive oil around it before serving. 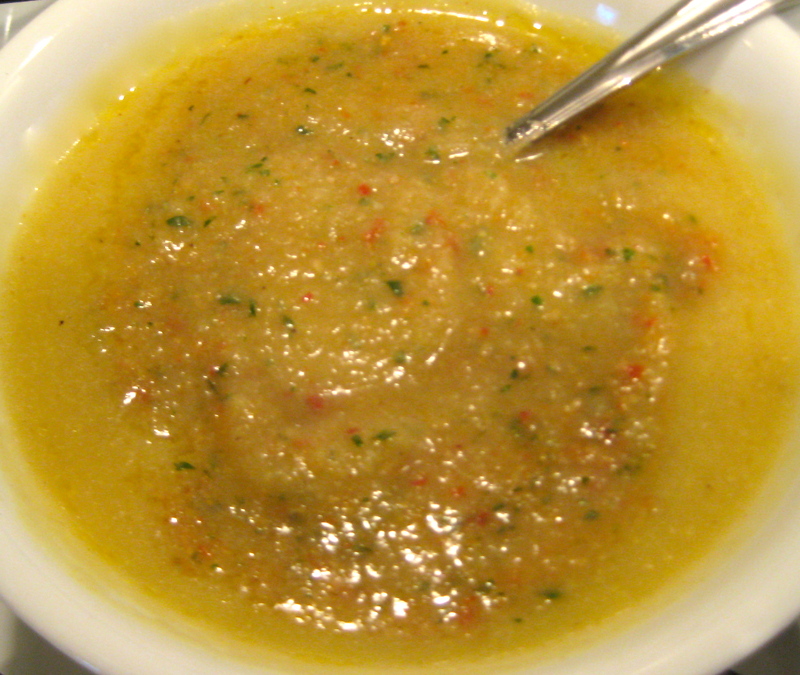 After admiring the pleasing aesthetic quality of the soup, stir the pesto into it and tuck in! We really enjoyed this first meal in our new home. I’m looking forward to continuing to be inspired in the new kitchen! Congratulations on so beautiful a new stove! Mine, too, has a convection oven but I so rarely use it that when I should, like for a holiday roast, I’m afraid to mess things up! 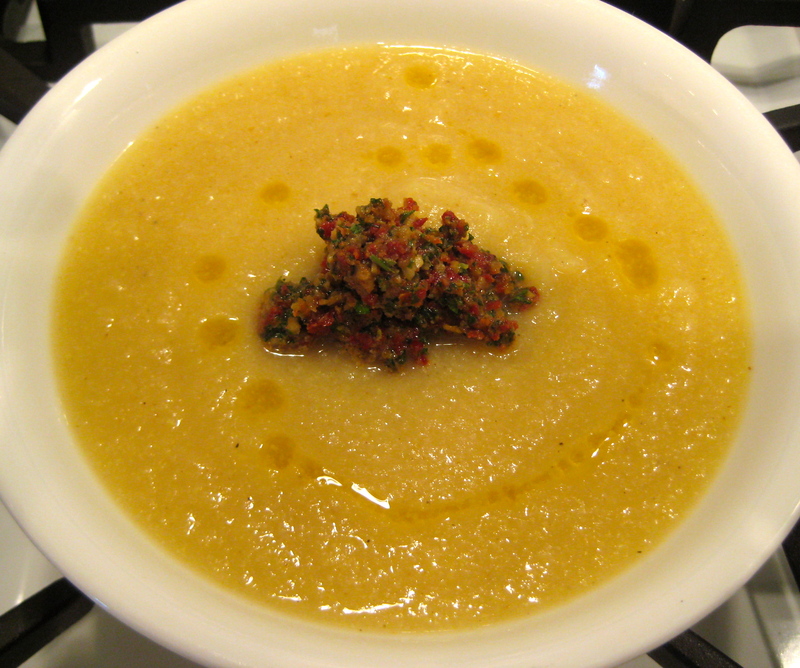 THis is one good-looking bowl of soup you’ve created and it sounds delicious. It’s a fitting christening for your new kitchen! May you prepare many wonderful meals on that stove and in that kitchen for many years to come! 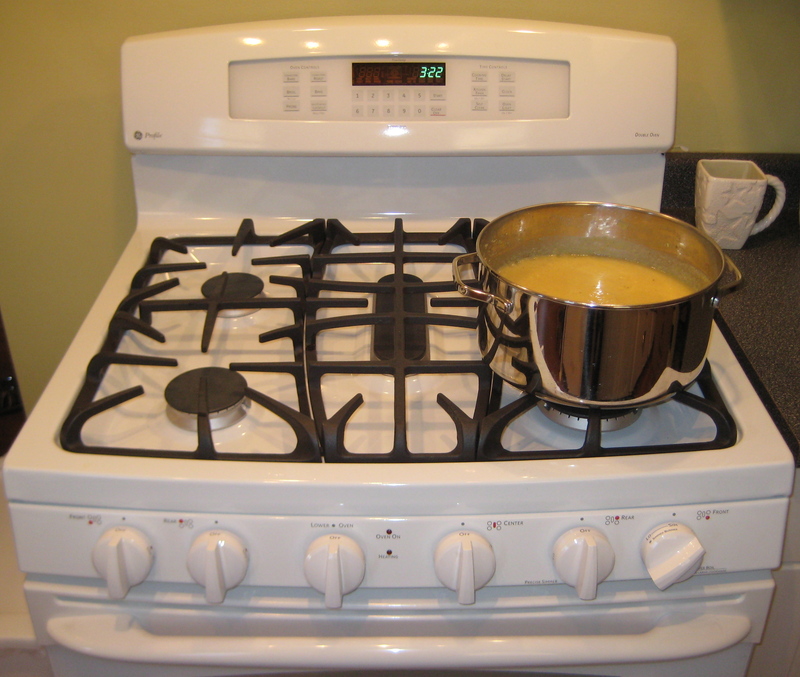 Thank you, I feel really fortunate to have such a nice stove. I’m going to read up about using a convection oven before giving it a try. Thank you for your good wishes. My new kitchen is a big improvement over the old one, and I feel like the proverbial kid in a candy shop! The aroma that filled our new house was overwhelming…this soup is one of my favorites…what a wonderful first meal in our new nest!!! I’m glad you liked the soup enough to have it two days in a row! Good fuel for all the unpacking and arranging of things.